Mahakala is the Lord of time and Death. One of the 12 jyotirlingas in India, the lingam at Mahakal is believed to be swayambhu (born of itself) deriving currents of power (shakti) from within itself as against the other images and lingams which are ritually established and invested with mantra-shakti. Bhulokhe Cha Mahakalah lingatrayah namaustuteye "
“In the sky is the Taraka linga, in the nether region is the Haatkeshwara and on the earth is Mahakaleshwara. We venerate the three lingas”. 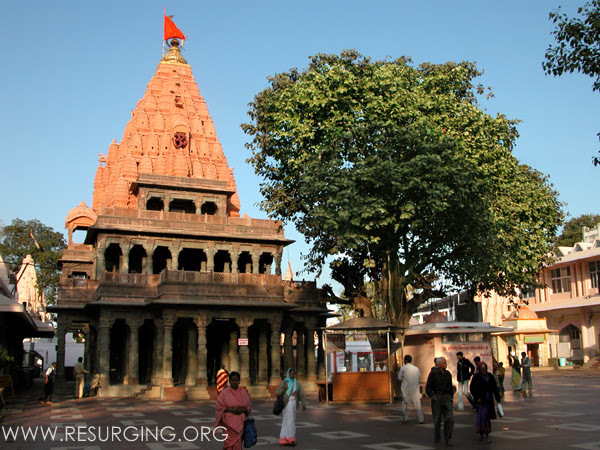 The ancient and historic city of Ujjain or Avanti in Madhya Pradesh is home to the Jyotirlinga shrine of Mahakaleshwar. Amongst the 7 holy places that can liberate a human in Ujjain. It is important Shaivite place of North India. This Jyotirlinga is situated in the Mahakal forest in Ujjain, by the banks of the Kshipra river. The name Avanti or Avantika pleases Lord Shiva. It is considered as very holy and pure place. One comes across a number of stories in the Puranas associated with the Mahakaleshwar Linga. The Mahakal Temple, one of the twelve Jyotirlingas, is a famous and venerated Shiva temple. The Shivling in this temple is supposed to be the only Jyotirlinga which faces south and hence it is known as Dakshinmukhi or the south-facing ling. It is the most popular and important temple of Ujjain. Every year on shivratri (claimed to be the Wedding day of Lord Shiva), there is a huge crowd of devotees for darshan. The same kind of public crowd can be seen in the month of Savaan, NagPanchami. On every Monday of "Savan", there is a huge procession for the Lord Shiva idol in the city attended by large numbers of devotees from across the India. > According to Hindu scriptures, the universe is seen as consisting of three regions-the sky, the earth and the nether. Mahakal is Lord of the earth. Out of the 12 Jyotirlingas, only Mahakal is known as the Lord of the earth and Lord of the death (Kaalo ke kaal Mahakal). 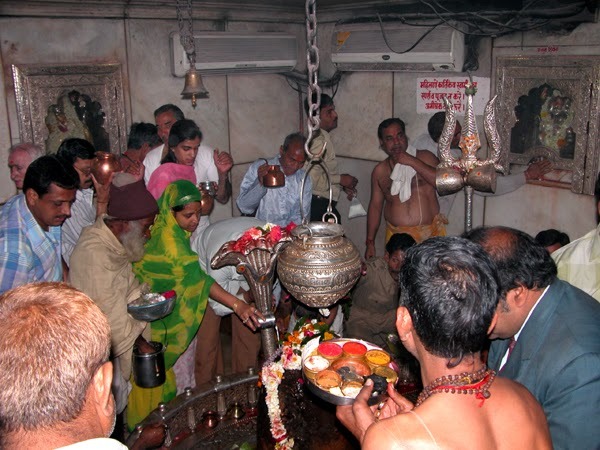 > Mahakal is also prime attraction for devotees in Ujjain. The savari or procession of king Mahakal is a unique celebration. Mahakal sitting in Palanquin moves in the city and the devotees from different corners of the world gather to have a glimpse of their beloved king. The message underlying becomes clear that when the ruler cares for his subject, the subject makes him god. In the state gazette, this day is recognised as a Parva. > To provide shoulder to the panquin of Mahakal is included in the responsibilities of the minister of the state administration, the district collector and the police Superintendent. During the month of Shravana, the savari is being organised on every Monday. On these days, the Mukhauta(the face) of the Lord Mahakal is moved in the city in the form of a procession. This event takes place between 4:00 pm to 7:30 p.m. On all Mondays of Shravana and first two Mondays of Bhadrapada, the savari takes place. Similar tradition of savari on all Mondays of the Kartika and Vijayadashmi is also followed. > According to a story, a five year old boy named Shrikar was enthralled seeing the devotion of king Chandrasena of Ujjain towards Lord Shiva. He took a stone and by considering it a linga started worshipping it regularly. Others thought that his worship as merely a game and tried to dissuade in all ways. But all the efforts went in vain. On the contrary the devotion of Shrikar increased day by day. Pleased by the boy’s devotion Lord Shiva assumed Jyotirlinga form and resided in the Mahakal forest. 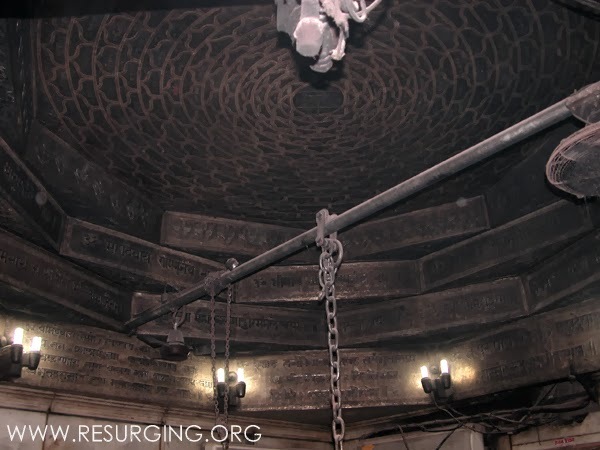 > Another Legend has it that a demon by name Dushana tormented the residents of Avanti and that Shiva appeared from the ground and vanquished the demon, and then upon the request of the inhabitants of Avanti, took up permanent abode here as Mahakaleshwara Jyotirlinga. 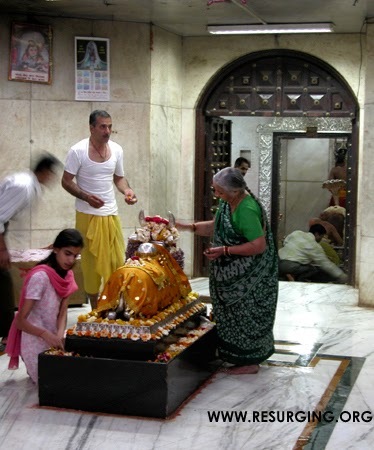 Also in Ujjain is the temple to Parvati - Harasiddhi Devi temple. The temple courtyard of Bhagwan Mahakaleshwar temple is very big. The temple is itself grand and beautiful. This Jyotirlinga is situated below the ground in a Garbha Griha. The linga is quite big in size and is encircled by a snake of silver. On one side of the linga there is the idol of Lord Ganesha, on the another side is the idol of Parvati and Kartikeya are installed. The Kumbha mela that is organised every year on the banks of the Kshipra river is very famous. All devotees take a holy water from the Kshipra river and seek blessings of Lord Mahakaleshwar. On the banks of river Kshipra, the city of Ujjain exists in Madhya Pradesh. It is also known as Indrapuri Amaravati, and Avantika. Because of the number of golden towers of several temples, this town is also known as “Swarna Sringa.” One of the seven cities of deliverance or salvation, Avantika Nagar has 7 Sagar Teerthas, 28 teerthas, 84 SiddhaLingas, 25-30 SivaLingas, Ashtabhairav, Ekadasa Rudrasthana, temples for hundreds of deities, Jalakund and monuments are there. The idol of Mahakaleshwar is known to be dakshinamurti, which means that it is facing the south. This is a unique feature, upheld by the tantric shivnetra tradition to be found only in Mahakaleshwar among the 12 Jyotirlingas. 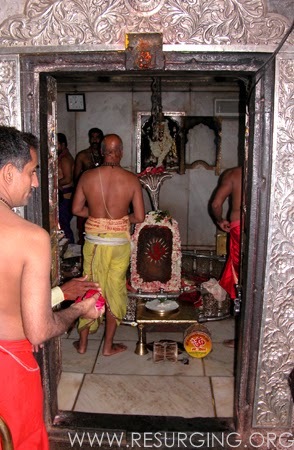 The idol of Omkareshwar Mahadev is consecrated in the sanctum above the Mahakal shrine. The images of Ganesh, Parvati and Karttikeya are installed in the west, north and east of the sanctum sanctorum. 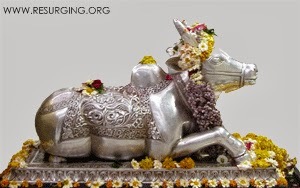 To the south is the image of Nandi, the vehicle of Lord Shiva. The temple is a three tiered one, with Mahakal at the lowest level, which is actually below the ground. At the middle (ground) level is a temple to Omkareshwar, and over it is a shrine to Nagachandreshwara. This is an interesting shrine which is opened only on Nagapanchami day every year. According to belief, 33 crore Gods reside in Mahakal premises. 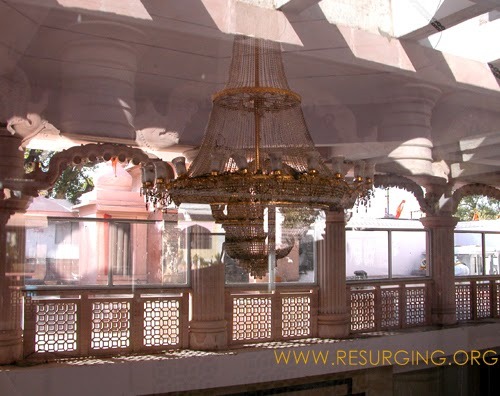 Adorned by Hanuman, Shiva, Devi, Navgraha, Radha-Krishna, Ganesha temples, the premises evokes vibrant spiritual feelings. Mahakal is the only temple among Dwadash Jyotirlingas, which has so many temples in its premises. Mahakal premises is also referred as home of gods. There are more than 42 temples in Mahakal temple premises. This include Lakshmi Narsimha, Riddhi-Siddhi Ganesha,Vitthal Pandharinath Temple, Sriram Darbar Temple, Avantika Devi, Chandradityeshwar, Mahakaleshwar Jyotirlinga in Garbhagriha, Omkareshwar Mahadev, Nagchandreshwar Temple(Which opens only on Nagpanchami in holy Shravan month),Nagchandreshwar Pratima, Riddhi-Siddhi Vinayaka. 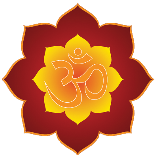 The main temple opens at 3:30 am .The Bhasma Arti is performed between 4:00 am and 6:00 am. Between 7:30 am to 8:15 am the Naivadya Arti is performed. Between 10:30 am to 11:15 am,the Mahabhog Arti is performed. In the evening, the Sandhya Arti is organised at 6:30 pm to 7:15 pm and Shayan Arti at 10:30 pm. The temple closes at 11:00 pm. To attend Bhasma Arti in Mahakaleshwar is desire for every Hindu devotee. Mahakal and Bhasma Arti are synonymous with each other. Bhasma means ash. Mahakaleshwar is the only Jyotirlinga temple,where the Bhasma Arti is performed. Amidst vedic chants and strotras and sounds of cymbals, conchs and damru, the Bhasma arti is performed every morning (Except the second day of Mahashivaratri) from 4:00 am to 6:00 am to the Lord Mahakaleshwar. The Bhasma is prepared by burning dried cow dung. The mahant of the Akhil Bhratiya Mahanirvani Akhada or his representative offers the Bhasma. The Bhasma Arti has its own protocols. During Bhasma Arti, no one can enter in the garbhagriha for worship wearing regular clothes. Only males wearing sola or silk clothe on their loins are allowed to enter into garbhagriha.At the time of Bhasma Arti,women are not allowed to enter inside. 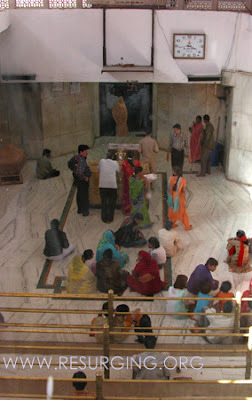 The devotees enjoy watching the great puja sitting in Sabhagruha just outside the garbhagriha. On next day of Mahashivaratri, the Bhasma Arti is held in afternoon after removal of the Lord's Sehra (bridegroom’s floral crown).This happens only once a year. 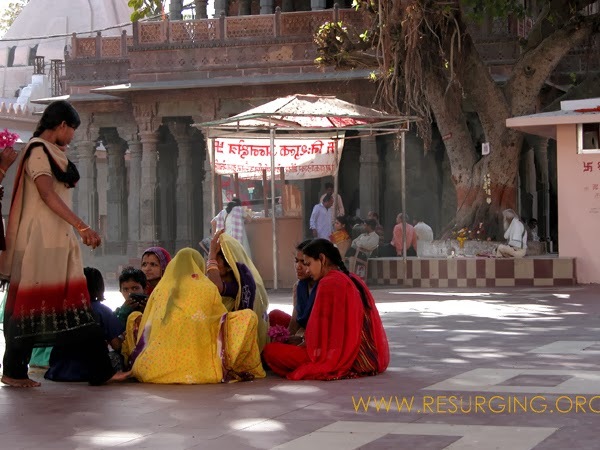 As mentioned, the Mahakaleswar Temple is another famous tantrik center of Ujjain. So for tantriks, the Bhasma Arti is most important. It is said that the ash with which the Shiva linga is 'bathed' every morning must be that of a corpse that has been cremated the day before. If no cremation has taken place at Ujjain, then the ash must be obtained at all costs from the nearest cremation ground. However, the temple authorities assert that though it was once customary for the ash to belong to a 'fresh' corpse, the practice had long been discontinued. Whatever the truth, pilgrims travel long distances to watch the Bhasm Arti. The belief goes that those who are fortunate to watch this ritual will never die a premature death. Mahakaleshwar temple is managed by Shri Mahakaleshwar Mandir Prabandh Samiti, Ujjain. The authorities have put remarkable efforts for the comfort of devotees, cleanliness drive etc. Many pujas are performed in the Mahakaleshwar temple. The rates are different. For simple puja it is Rs.51/-, Abhishek Mahimna Strotra Rs.101/-, Rudrabhishek Vedic puja Rs.151/-, Abhishek Mahimna Strotra puja Rs.251/-, Rudrabhishek Ek Darshana Vedic puja Rs.501/-, Laghurudra Rs.1500/-, Maharudra Rs.11,000/-, and Mahamrityunjay Jap Rs.15,000/-. 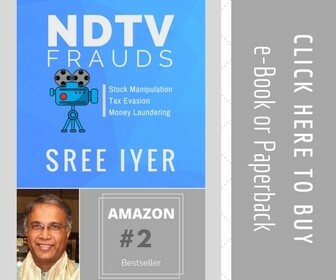 The devotee who wants to perform such puja first has to deposit the amount in the trust office in temple, get receipt and contact the assigned pandit by the office. The pandits normally sit outside the garbhagriha and after getting the receipt, they perform the puja with the devotee. The pandits are not greedy and helpful kind of persons. The office also give prasads to devotee for such pujas. Devotee can self perform puja in the garbhagriha. It is said that Mahakal is Mrityunjaya and his worship saves the devotees from the clutches of death. In a year at Mahakaleshwar, the Mahamrityunjaya puja is done more than a crore times. It is believed that the patient for whom this japa is done get cured, those on death bed get well. There are seven special parva pujas and special events of Mahakal in a year. This includes Shravan Mahotsava in the holy month of Shravan, Harihar Milan on 14th day of the Kartik Sud(bright fortnight),Narak Chaturdashi, Uma Sanjhi Mahotsava which is organised on 11th day of Ashwin vad(Dark fortnight),pradosh(on the 13th day of every dark and bright fortnight),Mahashivaratri and Nagpanchami(5th day of the bright fortnight in holy shravan month). Mahashivaratri Festival or the ‘The Night of Shiva’ is celebrated with devotion and religious fervor in honor of Lord Shiva, one of the deities of Hindu Trinity. Shivaratri falls on the moonless 14th night of the new moon in the Hindu month of Phalgun, which corresponds to the month of February - March in English Calendar. Celebrating the festival of Shivratri devotees observe day and night fast and perform ritual worship of Shiva Lingam to appease Lord Shiva. Various traditions and customs related to Shivaratri Festival are dutifully followed by the worshippers of Lord Shiva. Devotees observe strict fast in honor of Shiva, though many go on a diet of fruits and milk some do not consume even a drop of water. Devotees strongly believe that sincere worship of Lord Shiva on the auspicious day of Shivaratri, absolves a person of sins and liberates him from the cycle of birth and death. Shivaratri is considered especially auspicious for women. While married women pray for the well being of their husbands unmarried women pray for a husband like Lord Shiva, who is regarded as the ideal husband. On Shivaratri, worship of Lord Shiva continues all through the day and night. Every three hours priests perform ritual pooja of Shivalingam by bathing it with milk, yoghurt, honey, ghee, sugar and water amidst the chanting of “Om Namah Shivaya’’ and ringing of temple bells. Nightlong vigil or jaagran is also observed in Shiva temples where large number of devotees spend the night singing hymns and devotional songs in praise of Lord Shiva. It is only on the following morning that devotee break their fast by partaking prasad offered to the deity. "OM TRAYAMBAKAM YAJAMAHE SUGANDHIM PUSTIVARDHANAM, URVA RUKMIV BANDHANAN MRUTYOR MUKSHIYAMAMRTAT"
AKAL MRATU VO MARE JO KAM KARE CHANDAL KA, KAL USKA KYA BIGADE JO BHAKTA HO MAHAKAL KA ""JAY JAY MAHAKAL ...... JAY JAY MAHAKAL ""
Besides there is a temple called Sakshi Gopal which according to belief provide sakshi(evidence) of the darshan of the devotee to Mahakaleshwar. There are other temples like Sankatmochan Siddhadas Hanuman, Brihaspateshwar Mahadev, Kaal Bhairav temple , Trivishtapeshwar Mahadev, Bhadrakali, Navgraha, Marutinandan Hanuman, Vrikha Triveni, Neelkantheshwar, Ancient Nagbandha, Khanderao Dakshini Maratha temple , Govendeshwar Mahadev, Suryamukhi Hanuman, Lakshmi Pradata Modh Ganesh, Swarnajaleshwar Mahadev, Shani temple, Koteshwar Mahadev, Saptarshi Temple, Anadikalpeshwar Mahadev, Shri Bal Vijay mast Hanuman, Omkareshwar Mahadev and Vriddhakaleshwar Mahadev. There is a temple called Swapanweshwar Mahadev, which is one of the 84 Mahadevas of Ujjain. According to Skand purana, the darshan of this temple provides relief to the devotee from evil dreams and the bad effects of such dreams are nullified. On the 8th and 14th day of the every fortnight a special worship is offered. By Road : Well connected to all cities.